The Golf Club has two rooms with great views that inspire creative, productive meetings. Each room features audio-video capabilities, flexible floorplans, breakout options, retractable shades and convenient activity options. We coordinate coffee service, catering and snacks to keep the energy flowing during the day. Ideal for half or full-day corporate outings year-round. Make your next Happy Hour interactive! 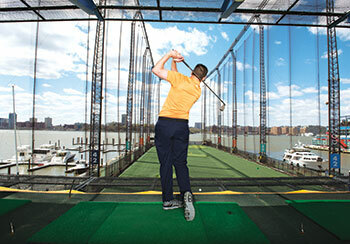 Guests have access to reserved golf stalls, unlimited balls, clubs, and stunning views of the Hudson River. 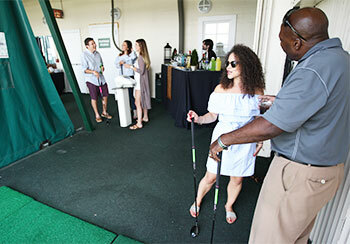 We set up a full-service bar right on the tier of the driving range and coordinate your catering. Reception spaces are also available for larger groups. Ideal for warm weather days or nights. Whether you are planning a company outing or a special occasion with friends and family, our versatile event spaces are ideal for a wide range of receptions. Both the Ryder Cup Room and THE PLAYERS Room feature convenient golf options and can also accommodate outside entertainment such as casino or arcade games. We coordinate the activities you choose along with the bar and catering services. Ideal for corporate events, birthday, bachelor and bachelorette parties. The Golf Club provides a country club feel without leaving Manhattan. Your Event Manager will help you select the appropriate event space (which serves as ''home base'' during your event), stock the room with meeting essentials, and provide a selection of easily accessible activity options to help drive creativity and encourage collaboration. Ideal for full or multiple day corporate outings year-round. The hardest part about golf is getting started. 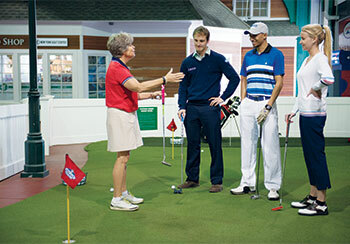 Golf 101 introduces the important basics, including etiquette, equipment, grip and stance, so your group can learn with confidence. An Event Manager works with our high-tech Golf Academy to customize your class, making sure the professional instruction matches your group's skill level. Ideal for corporate outings year-round and available for all golf levels. Planning your next celebration? Bring golf into the festivities. Great for kids and adults of all ages. 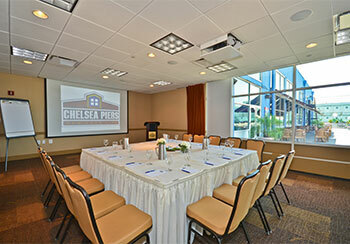 Reception spaces are available year-round and for larger groups. Ideal for milestone birthdays, bachelor and bachelorette parties. 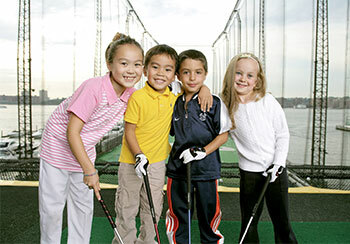 The Golf Club at Chelsea Piers is like no other venue in Manhattan. 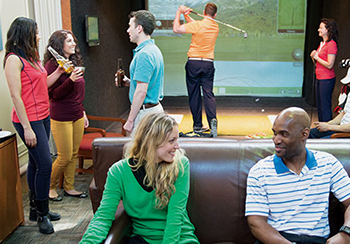 In addition to being a year-round destination to learn, practice and play golf, the Club also features versatile event spaces, making it the ultimate location for your next corporate offsite or social gathering. Experienced Event Managers will help you custom-design your group’s experience with as much, or as little, golf as you envision and coordinate catering and beverage service based on your needs. Take a virtual tour of our dedicated event facilities and Golf Club facilities. Learn more about planning an event at the Golf Club.